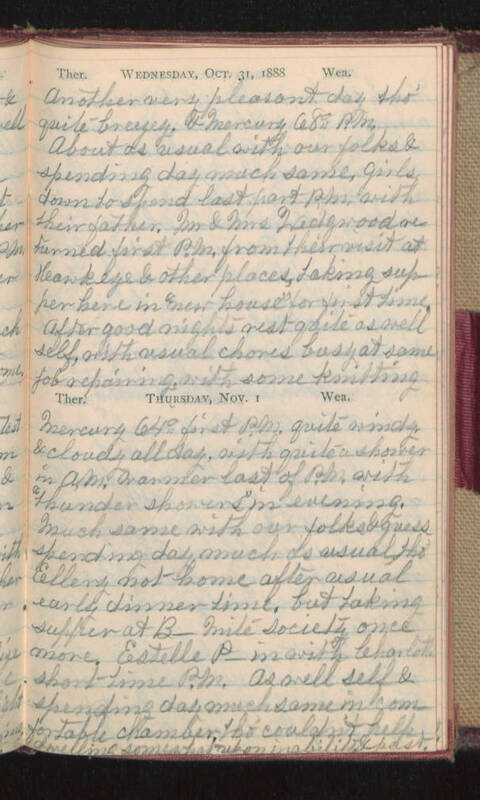 Wednesday, Oct. 31, 1888 Another very pleasant day tho' quite breezey, & Mercury 68° P.M. About as usual with our folks & spending day much same, girls down to spend last part P.M. with their father. Mr & Mrs Wedgwood returned first P.M. from their visit at Hawkeye & other places, taking supper here in "new house" for first time. After good nights rest quite as well self, with usual chores busy at same for repairing with some knitting. Thursday, Nov. 1 Mercury 64° first P.M. quite windy, & cloudy all day, with quite a shower in A.M. Warmer last of P.M. with "thunder showers" in evening. Much same with our folks & guess spending day much as usual tho' Ellery not home after usual early dinner time, but taking supper at B- Mite society once more. Estelle P- in with Charlotte short time P.M. As well self & spending day much same in comfortable chamber, tho' couldn't help dwelling somewhat upon inability past.